then after allowing for whatever State Pension is due your way, you’ll be living off whatever wealth you have accrued during your working life (plus whatever return you can achieve on that wealth). We've previously looked at how you might calculate how much wealth you need to build before retirement. Today I'm going to run a sobering simulation that demonstrates just how important it is firstly give yourself some contingency in those retirement calculations but then secondly monitor your progress once in retirement, adjusting where necessary (just as you did during the accrual stage), to prevent yourself from running out of investments. Our retiree decides to pull the retirement trigger on the 31 December 2006. On that date the FTSE100 was 6,220, it peaked the following year and today it sits at 6,308. That’s a nominal rise of only 1.4% in around six and half years. You've probably guessed our retiree retired just before the Global Financial Crisis (GFC) took hold. Our retiree removes his income for the following year on the 31 December of each previous year. That income is placed in a safe place where a derisory amount of interest is earned. All calculations are conducted in real (inflation adjusted) terms meaning that a £ in 2006 is equal to a £ today. The inflation measure used to correct for sterling devaluation is the Retail Prices Index (RPI). 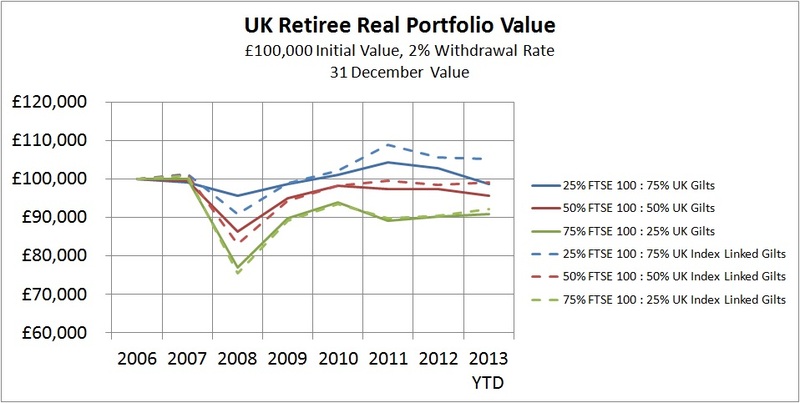 6 Simple UK Equity / UK Bond Portfolio’s are simulated for our retiree. The mix includes our retiree being conservative (25% UK Equities : 75% UK Bonds), standard (50% UK Equities : 50% UK Bonds) and aggressive (75% UK Equities : 25% UK Bonds) when it comes to portfolio risk. Two different bond types will also be used in the simulation. The UK Equities portion is always the FTSE 100 where the iShares FTSE 100 ETF (ISF) is used as the proxy. For the bonds portion a simulation is run against UK Gilts (FTSE Actuaries Government Securities UK Gilts All Stock Index) where the iShares FTSE UK All Stocks Gilt ETF (IGLT) is used as the proxy. We also run a simulation with the bond type I prefer in my own portfolio, UK Index Linked Gilts (Barclays UK Government Inflation-Linked Bond Index), where the iShares Barclays £ Index-Linked Gilts ETF (INXG) is used as the proxy. 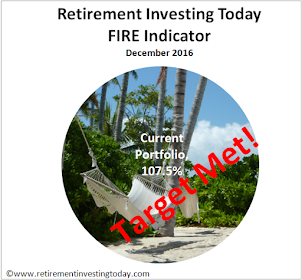 Our retiree rebalances to the target asset allocation on the 31 December of each year to manage risk. Only fund expenses are included. Trading commissions, wrapper fees, buy/sell spreads or taxes are not. Let’s look at some differing initial withdrawal rates. This initial withdrawal rate is the one typical used as a rule of thumb for Safe Withdrawal calculations. It says that if in the first year of retirement you withdraw 4% of your portfolio, then yearly up rate your withdrawals by inflation, the end result will be that you won’t exhaust your portfolio in your lifetime. In our case because we are already allowing for inflation correction in the wealth value we don’t correct the withdrawals. A 4% withdrawal rate means £4,000 being taken from the portfolio every year for the rest of our retiree’s life. 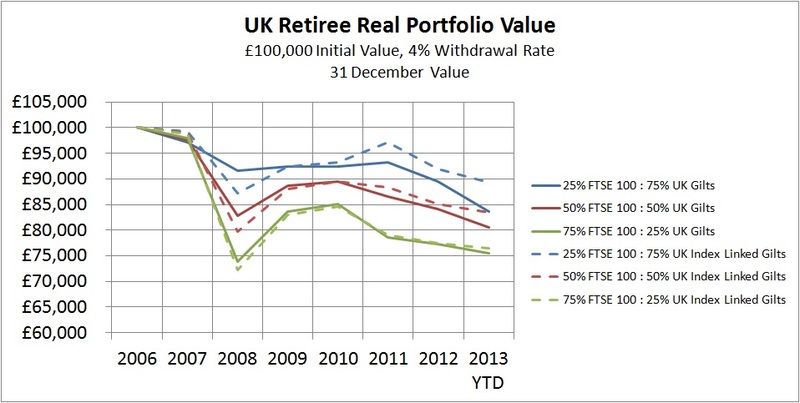 The performance of our retiree’s portfolio is shown in the chart below. Unfortunately it’s not good news. 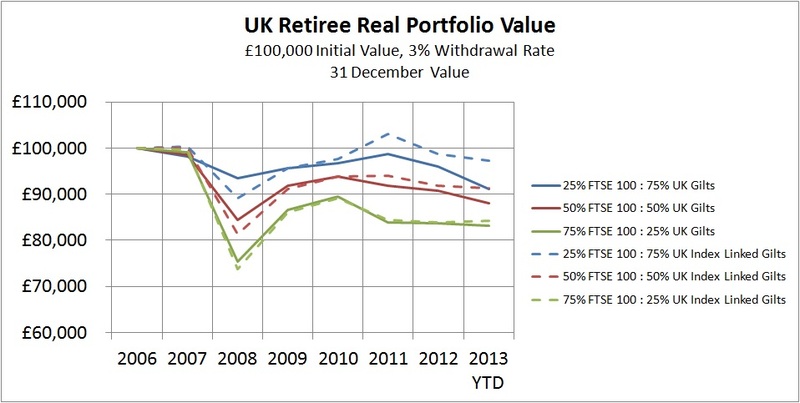 In the best case, the 25% FTSE 100 : 75% UK Index Linked Gilts portfolio, 11% of portfolio value has already been lost. In the worst case, the 75% FTSE 100 : 25% UK Gilts portfolio, 24% of wealth has been lost. All of that has occurred in only 6.5 years. Will the portfolio ever recover from here if our retiree was to continue withdrawing a real £4,000 per annum? Of course only time will tell but if it was me I’d be slowing down spend drastically and looking for some other income streams. Even if we drop the initial withdrawal rate to 3%, or £3,000 withdrawn per annum, our retiree is still in some trouble. Our retiree has lost between 3% and 17% of wealth in real terms. I’d still be taking action. Drop our withdrawal rate to a lowly 2% of starting portfolio value and problems are still afoot. To put 2% into perspective our retiree would need wealth of £1 million for an annual income of £20,000. In this case only one of the 6 portfolios is above the initial £100,000 starting point with two very close to holding station. When I ran these numbers it hit me really hard how serious this retirement planning business really is. It is not a game to be played lightly. Get it wrong or just choose the wrong retirement day and it could mean a retirement that is not what was envisaged. It’s certainly encouraged me to keep reading and to take nothing for granted. I've completely taken gut feeling out of my investing and retirement planning. 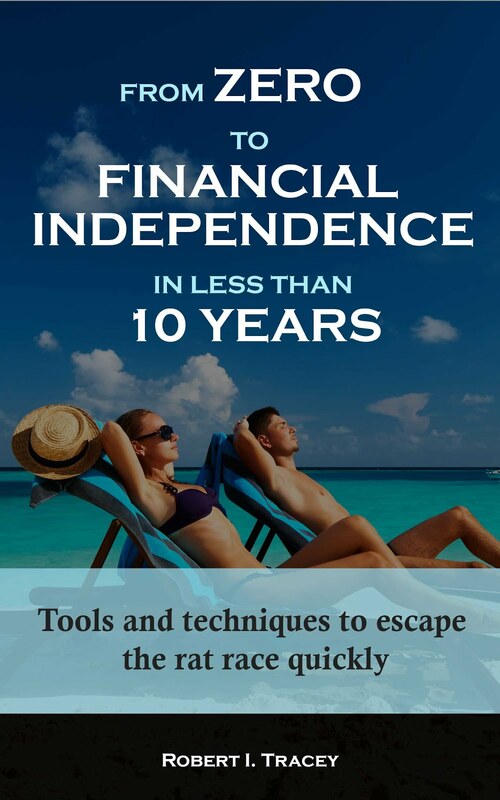 Are you using a Financial Advisor or are you DIY? If using an Advisor and you're using gut then it might be time to assess whether you have the right one. If DIY then it is possible to be fully scientific. Have you read Time Hale's Smarter Investing from cover to cover? It sounds like we are much closer than I initially feared. I agree with you on the uncertainty but there's not much we can do about that one. :-) I also think that life uncertainty is in many instances what actually makes life interesting. I know I'd get bored pretty quickly if I knew the outcome of all of my life's decisions. I'm also struggling with one of the points you raise. That is the live for today or save for tomorrow question. It's a very fine line to walk. I know that naturally I am probably too far to the "saving" side while my better half is more to the "spending" side. It makes for some interesting discussions and compromises but overall I still end up with around 60% of gross earnings going towards financial independence so am happy. Nothing to be envious of. Just different choices we're making. It just sounds like I'm a bit more jam tomorrow in my balance than yourself. To compare my summer holiday this year will be a lot closer to home but still result in some Vitamin D.
That said at the end of the day 30% is still probably more than 99% of the population so our paths are probably closer than the %'s say. I'm struggling a little with the downward trajectory on the charts for the past 18m or so - especially the 75% equity. From memory, 2012 was quite a decent year - around 10% TR for the FTSE, so deducting 4% income and allowing for 3% inflation should show a rising line? Likewise for the start of this yr the FTSE has had a good start and I would have expected a rising line? Am I missing something (would not surprise me!)? With my own pension drawdown started 12m ago, the withdrawal rate is just over 4% but even allowing for this income withdrawn, the capital appreciation is 10% higher than June 2012. Great to hear from you. I see DIY Investor (UK) is still developing nicely. - 2012 had ISF up 7.1% after expenses of 0.4%. However IGLT was only up 2.9% and INXG up only 1.1% after expenses. Inflation was 3.9% (Previous years inflation taken at start of following year). Also going in to 2012 our retiree had less than the original £100k. That all adds up to a falling line in all but 3 cases. - 2013 ISF year to date is 6.6%. Bonds are -0.1% and 5.0% respectively. Inflation is 3.3% as the way I've done the maths our retiree gets the full year prior inflation even though it's only a partial year. Additionally our retiree has also already pocketed a full years salary. Both assumptions could maybe be a little too conservative but when it comes to retirement planning I'll take that. If the market rose at the current rate for the remaining 6 months of the year then we will see an up tick in a number of these cases. Glad to hear you're up circa 14% over the past 12 months or so. As you'll know from my quarterly and yearly updates my strategy since 2007 has also significantly beaten a simple stocks:bonds portfolio (whether it continues to do so is another question altogether) such as this. I don't calculate rolling yearly CAGR's to compare but I do know that year to date 08 June I am only up 2.6%. In 2012 as of the 02 June I was only up 1.2% but finished the year with a CAGR of 12.6%. That makes me think I'm also probably pretty close to your 14%. Of course we've had no discussion about risk profile which could make comparison futile. I would just question your figure of 7.1% total return for ISF - are you sure this includes income? The FTSE TR for 2012 (incl dividends) was exactly 10%(FTSE All Share a little higher at 12.3%) so, deducting the expenses figure of 0.4% you should be left with 9.6%. Taking off 3.9% inflation gives 5.7% which is above the 4% income withdrawn so does the return on the 25% gilts drag it down so much? I will take a look at my pension figures in detail as the year will be up at the end of June. Should be worth an article on my blog! I make that a 7.5% increase which seems to then tie in with ISF having a total return of 7.1% after expenses of 0.4%. Where are you getting your 10% data from? Could there be an error on that side? I look forward to the upcoming post. As you know you are a few years ahead of my retirement journey and so I still have plenty to learn. I'm sure there will be an explanation to clarify somewhere but I'm pretty sure the 7.1% figure you are using must be incorrect. Thanks for that John. I took my data from the FT and iShares websites both of which seem to correlate but your FTSE pdf seems to disagree. I'm not sure which source/s are actually wrong but at the end of the day we're now probably at a level of detail that isn't required as far as the message of this post is concerned. For the purposes of this post it actually doesn't matter whether in 2012 the FTSE 100 total return was 7.1% or 10.0% as our retiree is still a long way behind the wealth I'd like to be seeing even if we use the 10%. Are you sure you are taking the TR data from the FT?. Also, the 3% difference is just for last year - over the past 6 or 7 yrs it could make quite a difference to your hypothetical retiree! I know which return I would rather receive in my sipp. Problem solved. In this example I had initially looked at in year savings instead of year on year. Ie for 2012 I used 02 January 2012 to 31 December 2012 instead of using 30 January 2011 to 31 December 2012 on the assumption it wouldn't make a great deal of difference. It turns out that in 2012 it made a lot of difference. To make the post perfect I've been back through all the numbers. As you'll see the message the post presents still holds true. Really interesting article about the dangers of making assumptions about what is 'safe' when the assets you own turn out to be valued very optimistically. "The first thing to do is to work hard and save some money. The second thing to do is to establish an emergency fund. The third thing to do is to invest. The fourth thing is to get wealthy. The fifth thing is to generate income streams. And the sixth thing to do is to retire and spend every day on the beach." In my own retirement planning I combine 3, 4 & 5 and assume capital values equate to a 4% income after inflation. I even notionally value a final salary pension at 25 times the annual payment. Perhaps I should focus more on income and less on asset values which can vanish in a stock market crash. I think this is a big problem with the concept of safe withdrawl rates. An overvalued market makes it look like you can spend more than the safe limit. Market values sometimes ignore the safety and security of a reliable and rising income stream. Well I better stop my list there before anyone mentions tin foil hats, guns or gold. But another point that I don't read much about is that owning physical assets like property gives you another option if they go up in value. E.g if a house goes up by £50,000 you can remortgage, take the cash out (TAX FREE!!!!) and live off that bonus capital for an extra 3-4 years while waiting for other parts of your portfolio to recover. You make a very interesting point. I currently do as you do for my total portfolio however when it comes to the HYP portion of my portfolio the first priority is to amass 15-20 shares (minimise company risk), from different industries (minimise sector risk), from the FTSE 100 (minimise stability risk) that will spin off dividends that rise at or above the rate of inflation. That is effectively a focus on maintaining real income (without having to sell any assets), as you suggest, and nothing to do with asset values. Maybe that needs to somehow be applied to the whole portfolio. Let's take it one step further. The FTSE 100 dataset that I use for my monthly CAPE post has dividend, earnings and price data back to September 2006. Over that time in real (inflation adjusted) terms we have seen prices vary by up to 1.9 times, earnings by 1.9 times but dividends by "only" 1.5 times. So dividends are more stable than prices and earnings. Additionally on the gilts front if you buy them direct, rather than through a fund, you know exactly what the yield will be every year. There's definitely some research to be done around that topic. Your comment "agricultural or wood land that is rented out and/or used to save money on necessities like food and heating" also hit very close to home. That's exactly what I'm looking for. A small home with a little land for some self sufficiency. I have the gold but don't think I'll need the tin foil hat or gun :-) Unfortunately prices for that sort of thing (when they come up) in the South East are ludicrous. I'm seriously exploring whether I should just stay out of the property market until I retire and then head a little more north where that sort of thing exists for a lot less. Who knows maybe the market may have corrected a little by then. Cheers for the thought provoking post. Sometimes stockmarkets shoot ahead. Sometimes they just flat line for years. Anyone retiring in 2006 & living of stocks might just have received terrific stockmarket gains going back to the 1960s to build their portfolio in the first place. As for 4% withdrawal rate, well it's not difficult to buy a portfolio of sensible stocks with a 4% dividend yield. I reckon that has a better chance of keeping up with inflation than an annuity of any description. But as this case shows it doesn't matter what happened previous to the date our retiree retires so in your example 1960 to 2005 is irrelevant as that just built the wealth. Once the retirement date is selected the only thing that then matters is the drawdown amount, portfolio and what Mr Market throws up. This post then shows Mr Market can put our retiree into trouble quickly and so continual adjusting to market conditions may be needed along with some healthy contingency in retirement. Personally I'm not into the withdrawal rate approach, I aim to live off a combination of pension income and dividends when I retire. My investments will consist of individual shares (HYPish), I.Ts and a back up of cash, index linked bonds and if they still exist(!) NS&I index linked certificates. The pension will cover 'needs' and the divis the 'wants', I have no intention of selling my capital to provide income. That's the plan, for me it's about income streams, but I can see the attraction of withdrawal rates when using index funds, especially if an individual is not interested in finance and investment. For those without a db pension it is a challenge, my view is that a portfolio of I.Ts is something to seriously consider, particularly when held within ISAs. I am not a fan of pensions, to restrictive, I would prefer my employer to ditch the pension and up my pay. I can invest it and retire when I want. I also dislike the restrictive aspect of pensions. However, that's offset by tax efficiencies, particularly for any income taxed at the 40% rate. I've come to believe the age restriction isn't as restrictive as I used to think. If you have the misfortune(!) to accumulate 25 times your earnings in your pension before the minimum age then you can run down the capital in your ISAs for a few years to tide you over. The biggest danger is further government rule changes - they already arbitrarily increased the age from 50 to 55. I have a nagging worry that one day my SIPP will get part-nationalised to plug the black hole in public sector pensions. Ahoy! Is this of any interest?